Victor Buso is a locksmith. He spends his days fiddling with locks and keys, and in his spare time he stares into the heavens in the observatory he built on the top floor of his own home. He’s devoted an incredible amount of time and money to his personal passion of skywatching, and now he’s the first person on the planet to witness something that scientists have been hoping to see for decades: the birth of a supernova. Using the high-powered telescope mounted above his home, Buso recorded the bizarre behavior of a distant star. The far-off star let out a massive purge of energy from its core just moments before it exploded, confirming long-held beliefs of the birth of supernovas and landing his Buso’s name in the history books. Buso, who told The Washington Post that he inherited his love of astronomy from his parents, witnessed the incredible sight after aiming a newly-acquired telescope-mounted camera at the distant galaxy NGC-613. The galaxy sits some 65 million light-years from Earth, meaning that everything we can see from it is as it was 65 million years ago. It just so happened that Buso’s timing was perfect, because he was able to spot a tiny bright speck that wasn’t there previously, and it was getting brighter. He recorded the event and, after seeing that the tiny blip had eventually resulted in a supernova, he knew it was an extremely important sighting. The odds of stumbling upon a pre-supernova event such at this is something like 1 in 10 million, according to astrophysicist Melina Bersten, and it’s never been recorded before in the history of astronomy. 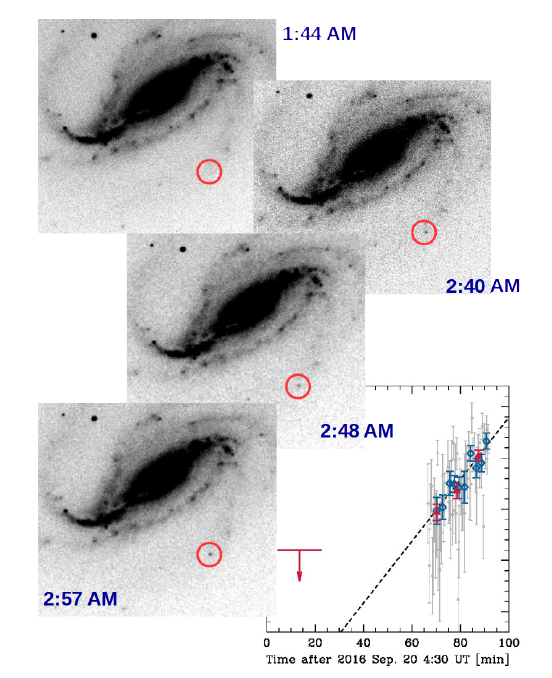 Soon, other astronomers began to record their own observations and, with the help of Buso’s incredibly early sighting, were able to determine what kind of star had birthed the supernova. They believe it was a supergiant star roughly 20 times the mass of our own sun, and the researchers were able to create computer models to simulate how the entire thing unfolded. The research was published this week in Nature.